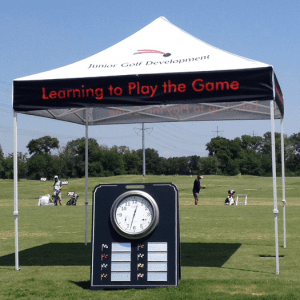 The Junior Development Program is a year round golf EDUCATION program that teaches and develops the necessary skills to play golf at a competitive level. This program is designed to create a love for the game by developing athlete’s first and golf specific skills second. Our players will be primed to compete in tournaments with the North Texas PGA, Middle School, High School, and the Collegiate levels. This program is a staged approach to teaching golf for children ages 5-14. There are six (6) Stages the Junior Golfer will progress through before entering the official JUNIOR GOLF TEAM. All stages will incorporate Fundamental Movement Skills (FMS) such as running, jumping, skipping, etc. as well as Fundamental Sport Skills (golf and general sport skills).